It is recommended a therapist fit and supervise use with the collar. 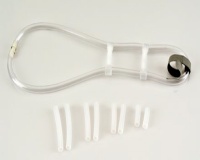 Simple and easy adjustments are made using the interchangeable tubes. Longer tubes can be inserted to provide improved alignment. All parts for the totcollar are available as replacements. The Tot Collar is cool, comfortable, easy to put on and remove, low profile with an unobtrusive appearance. It is easy to keep clean with soap and water and the amount of support can be set to specific requirements. The Tot Collar is pre-assembled and ready to fit. There are two sizes: Adult and Child. The clear pvc tubing of the Collar is supplied at twice the circumference of the neck, plus 4″-6″ (10cm-15cm). The tubing is joined with an end connector. The white tubes or struts are selected according to the amount of lateral head tilt. Extra tubes are supplied with the collar to allow for change in lateral tilt. Tube A spans from posterior to the crest of the trapezius to the occiput. Tube B from anterior to the crest of the trapezius to below the tip of the mastoid process. Avoid pressure on the mandible. The tubes are short to start with and replaced by longer tubes as correction is achieved. If there is a significant amount of tilt then use very short tubes initially. Tubes can be trimmed to the exact size required. For correct fit, the infant should be holding his or her head in midline, slightly away from the struts. There should be room for at least one adult finger to fit between the top clear pvc tubing and the neck. Fit the Collar loosely at first and ensure that the lateral tubes are the correct size and on the correct side. Snug up the Tot Collar by hand to check the fit. Remove the collar from the child. Pull through the clear pvc tubing to remove the excess. Trim this tubing to length with scissors and reconnect with the end connector. Replace the collar after each trim to check the size and fit. Note: Be careful not to cut off too much of the clear tubing, it cannot be reconnected if size is cut too short. Use the Tot Collar with a stretching program for best results. 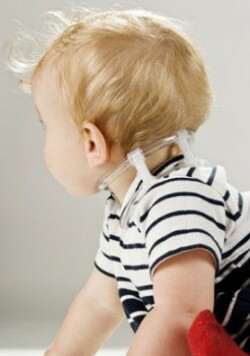 Caution: Do not leave the child unattended while wearing the tot collar!